Be able to look back on my life for an entire year – in photos. Meet other photographers through this project as well as the Project 365 group on Flickr. Take my camera everywhere. This is one of the main reasons why I decided to purchase the Canon S90. It’s small and compact and easily slips into a pocket. I’m going to try and tell a story with each daily image. Sometimes the story may be short which lets the image speak and sometimes I may want to inject more into the visual. I’m going to automate posting both on Flickr and here on the blog. This should reduce some of the work and time involved in this project and keep me on task better. I’m going to ask for your feedback so you can hold me accountable to complete this mission. So here we are at Day 1 and today’s image was one I took at the Eugene Asian Celebration at the Lane County fairgrounds. It’s an annual gathering of the Asian community to highlight the many Asian cultures that reside and work in this community. 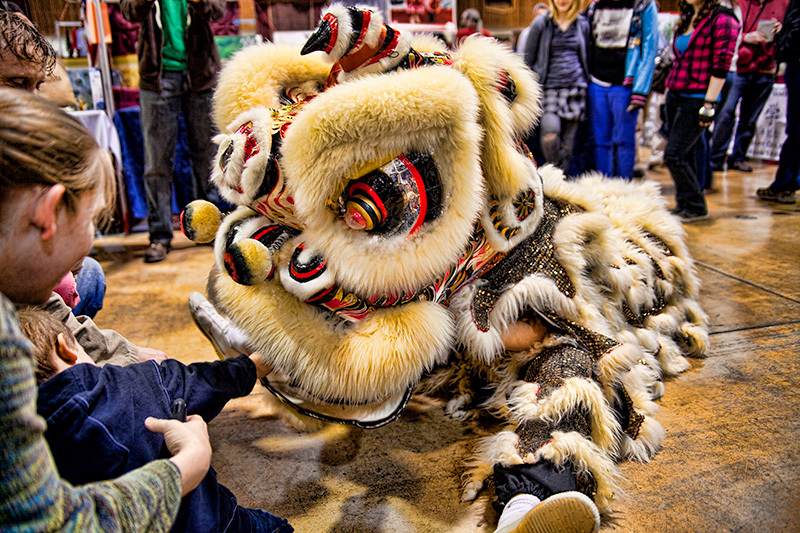 There are crafts and goods booths, performances on several different stages, Asian food, cooking demonstrations, arts and crafts for the kids, martial arts performances and exhibitions from just about every Asian country. It’s always a great time. Wandering around the event were a pair of Lion Dancers giving a performance to the crowds of people. It was interesting to watch how kids would react differently to the lions. Some kids would run away crying, others would shy away but still be curious while the more bold would go right in for a pet or hug. The performers doing the Lion Dance were really good. The kids got to do some crafts where they rolled paint onto a rubber fish and then put paper on top and blotted it down to create the image of a fish. They really enjoyed this. We finally ended the day with a nice meal of east Asian food from Pakistan. Lots of curry and spices. Welcome to Day 1 of Project 365 on Matt Koenig Photography. Well Matt, I look forward to your next 364 days of photographs and stories with great interest. Good luck! It will be an interesting journey and a great learning experience. @Tracker – If anything the experience of shooting a photo a day for an entire year will make me a better photogapher with a better eye. My fear is running out of ideas to shoot which sounds ridiculous because we are surrounded by things to shoot. The problem is to find a way to turn even a piece of garbage into a compelling image. Thanks for your coment!